Lihua never could have imagined that the birth of a little brother would end the life she knew. Raised in a poor country village, Lihua prayed her parents would have a son to bring peace and balance to the family. But she did not foresee how living in such poverty would force her parents to face a terrible choice they once made that would now cost Lihua everything. Suddenly told to leave her home, Lihua begins a treacherous journey alone. After being attacked on the road the first day, an unlikely hero comes to her aid: a panda she decides to call Panpan. 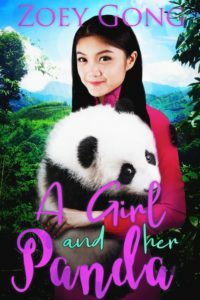 Bound together for love and survival, Lihua and Panpan travel together through the mountains and forest of western China as Lihua struggles to find her new place in the world. A Girl and her Panda is part the Animal Companion series, but each book is a stand-alone novel with new characters and adventures. ← Sneak Peek! First Two Chapters of A Girl and Her Tiger!